Oh, I’ll just drop by the parts store and grab an axle. Well, that’s how it seems when we talk so simplistically about trailer axles. But actually, there is a lot we need to know to get the right one. Here’s a the quick guide to understanding trailer axles and how they measure up when building a trailer. They’re not complicated, but fitting the trailer is a little more than picking a coffee mug to fit your personality. 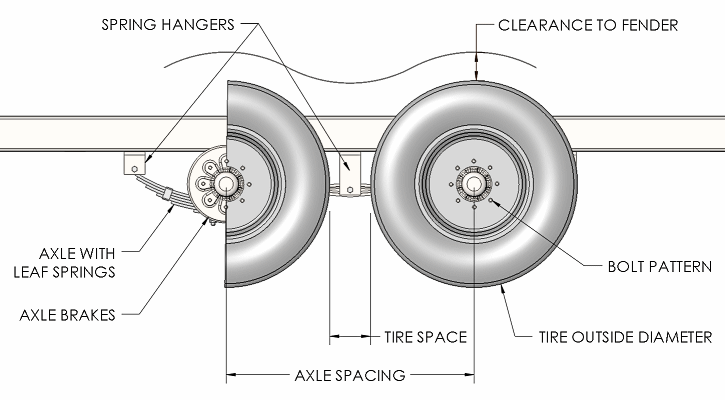 Axles (including the wheels and tires) have several key bits of defining information. The list below has the big ones, while the images give a visual to go with the words. There are also links with some items to other articles where more detail is available. Items in Bold are in the dimension illustrations. Leaf Springs, Coil Springs, Torsion, Rubber Compression, Axle-less, Trailing Arm, Walking Beam, etc.. There are many, types of suspension (axles), but just a few that are really common. In this article we’ll discuss primarily the Leaf Spring and Torsion types since they are most common, yet there are many similarities, and the info in this article is roughly applicable to all. Some things don’t matter for one type or another, so if you’re considering one of the others, just ignore those items that don’t apply. Read more in the Choosing Tandems & Triples article. How much weight can the axle carry? Load capacity is the weight rating for the axle. That’s a max, and that number usually defines the total capacity of the trailer. For multiple axles (like tandems), assuming axles are the same, simply add the capacities for a sum total. Generally speaking, look for trailer axles with more capacity than you need. Also, be sure to match springs and tires, because the real capacity is the lesser of Axle Capacity, Spring Capacity, or Tire Capacity. Don’t get caught short. For this discussion, Mounting Position means the measured location where axle connects to the trailer frame. For Leaf Springs it’s the Spring Centers distance. That defines the mounting. For positioning the axle fore and aft on the trailer, the article on Calculating Axle Position may interest. Because Torsion Axles don’t have springs to mount, it’s the bracket width (usually meaning the outside dimension of the frame members or Frame Width) that defines it’s Mounting Position. This is the distance — from side to side — between faces where the wheels mount. See the illustration. This distance is sort of meaningless by itself, but super important relative to other things on the trailer like the clearance to the frame, the tires, and the Overall Width. It is also restricted by axle manufacturers with respect to the Mounting Position so you don’t get too much or too little Overhang. Read more in the calculations section below. Looking at a front or back view of the trailer, this is the distance across the trailer between the centers of each tire track. In the illustration above, it is the same as the Hub Faces Distance. If the wheel mounting is centered in the rim, then the Track Width and Hub Faces Distance are the same. In some cases they are different. There are many bolt patterns available, so be sure the pattern of the wheels match the pattern of the axle. We call these patterns by the number of holes and the bolt circle diameter. For instance, 5 on 4.5″ means 5 holes on a 4.5″ bolt circle. Patterns with more lugs are for heavier loads. Some trailer axles have brakes, some do not. Check your local laws to know if you need them. There are a few types to choose, like Drum Brakes, or Disc Brakes, and the motive as Electric, or Hydraulic, or mechanical actuation. Electric are most common, and have good control, though surge hydraulic types are arguably easier to adapt a variety of vehicles (illegal in some areas). See the illustration. A Straight Axle is what you might expect — a straight beam with hubs at the ends. A Drop Axle just allows the trailer to sit lower, usually 4″ for a leaf spring style. Torsion style trailer axles handle the drop a little different. A rise or drop happens by setting the no-load Arm Start Angle. When that angle is ‘UP’, then it accomplishes a small “drop”. Conversely, if the angle is down, it’s like giving the trailer a “lift”. With leaf springs it’s primarily Eye-Eye, or Slipper type springs. This has to do with how the springs interact with the frame for mounting. Typically Eye-Eye styles are best with lighter trailers (both single and multiple trailer axles). Then, use slipper springs for heavy, multi-axle applications. We normally recommend Eye-Eye whenever practical. Obviously, with no springs, this item is not applicable for Torsion Axles. On this topic, it’s worth noting that not all trailer axles or mounting hardware are equal. Be cautious with springs and axles that are made for a specific purpose — like mobile home axles. Wrong assumptions about these will easily lead to big problems. Yes, it’s the distance for supporting the load — like the distance from Eye to Eye on double-Eye style spring. In general, longer springs give a better ride, but that’s not absolute. We recommend the longest springs that are practical for an application. For a lot more about spring length and choosing the right springs, read the article “The Value Of Spring Length“. And of course, this does not apply to Torsions. An item for Multiple Axle trailers. See the side view dimension illustration. While mounting hardware has an effect, Spring Length will largely dictate this distance. Some standards exist, like 33″ or 35″. Generally it’s good to stick with the standards. Follow the manufacturer’s instructions — and make sure you get the right stuff for proper Tire Space. Since it’s easier to illustrate than to explain, the image shows a pair of trailer axles — one with the springs mounted on top (or Overslung), and one with the springs mounted underneath (or Underslung). This makes a big difference in trailer bed height. It also affects stability in a smaller way. Read more about the differences and the effects in this Article on Overslung and Underslung mounting. While these terms usually mean Leaf Spring axles, they sometimes apply with less common suspension types too. For torsion axles, the option that is somewhat similar is “High or Low” brackets and “Inside or Outside” brackets. See the illustrations near the end of this article for more info on Torsion Axle brackets. Though technically not an axle part, choices about wheels and Tire Type and Size are very interrelated. See Bolt Patterns above. Also, the Tire Width and Capacity must fit the application. Both Wheel and Tire load capacities should exceed that of the axle. Read the post about Tires. Camber amounts to a slight bend in the axle which helps the trailer track the highway a little better. It’s a little tweak that helps tracking and tire wear. In general this is good if you’ll be on the highway a lot, but not necessary if the trailer is for short, local trips. 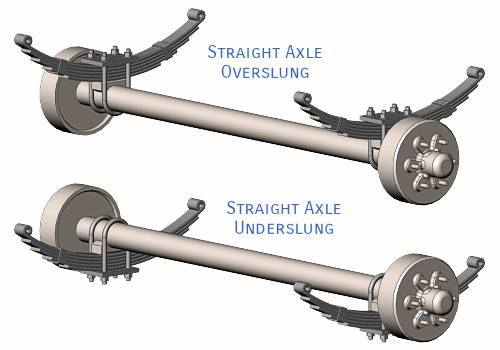 The image below shows a grossly exaggerated illustration of axle camber. Order axles either with or without camber. There are additional trailer axle details, but the list above covers the big ones. With this info, we can make some important measurements for the trailer — or maybe more accurately, from the trailer (before ordering trailer axles). To get some of the information for fitting, we need calculations. Here are some more definitions and explanations for key pieces that must match to properly mount a trailer axle. Mentioned above — either Spring Centers or outside Frame Width. This is a measurement from the trailer directly. Note the difference in the measurement for Leaf Springs versus Torsion Axles. Also from above. This measurement is explicit on the axle, but must actually include other factors as shown in the images. Think of the Hub Faces distance as a mathematical calculation: Spring Centers + 2 times the needed Overhang. Axles are specified with a Max and a Min Overhang. (True for both leaf spring axles and Torsion axles as in the tables.) If the overhang is too short, the frame will interfere with the tires, or mounting becomes ridiculous. If the overhang is too large, it reduces axle strength. Axle specifications are available from vendors (like in these data tables from Dexter) showing the allowable Overhang distances. Like it sounds, this is the space between the moving tire and everything else. We must have Clearance between the frame and the tire as in the (front view) image, and also radially around the tire (side view image), especially vertical for suspension travel. Usually 2″-3″ all around the tire is sufficient, then 3″-4″ vertical Clearance to the Fender for suspension movement. Finally, 3″-4″ or more as Tire Space between the tires for multiple axles. Don’t skimp on clearance. In a battle between steel of the trailer frame and rubber of the tire, the tire loses. Unfortunately, trailers don’t operate so well without tires. The total distance from side to side including the tires. It’s a summation of everything between. It’s the Hub Faces distance plus the Tire Width. Check local laws if you want to go wide, because most jurisdictions limit width. 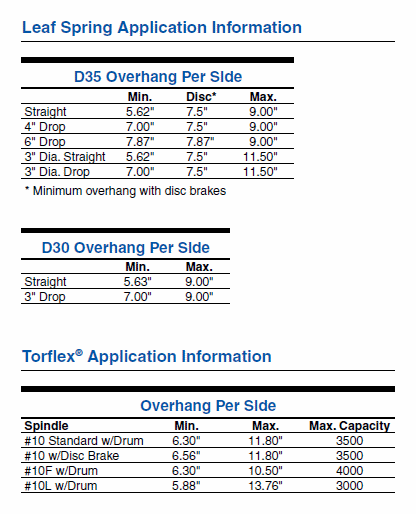 When you order an axle, here are the details you must provide. We think it’s best to make a list, and perhaps even a sketch. Refer to the information above, because we’ve covered the basics. That said, it’s not bad to research trailer axles by following the links or Googling these terms. Oh, and don’t just take someone’s word, because there is a lot of misinformation around . . . like this guy. Height of Mounting Bracket — High or Low Mount (see above). Typically, trailer wheels and tires order separate from the axles. For those, they need the Bolt Pattern, the Size (like 225-75R15) and the required Capacity. The above is basic information for trailer axles. Please follow the hyperlinks to other posts with more detail on the linked topics. While this information does not include specifics for your trailer, we are confident you will handle it from here. Bookmark the page to come back and review again when you’re ready to order your trailer axles. Just so you know, the Mechanical Elements Trailer Plans have all the necessary information to order the right axle(s). The information is in the instructions in the list of materials. Good Luck With Your Trailer Axles!